This afternoon, I suddenly just stopped everything; doing, eating, walking, emailing, writing, stretching and campaigning. 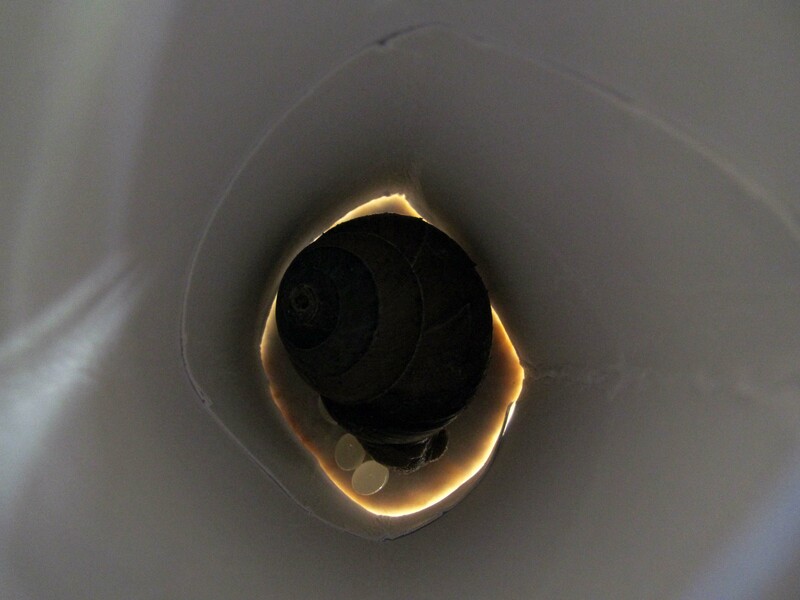 Something vastly more important came up… everything ground to a halt because I saw a snail. And I love snails. 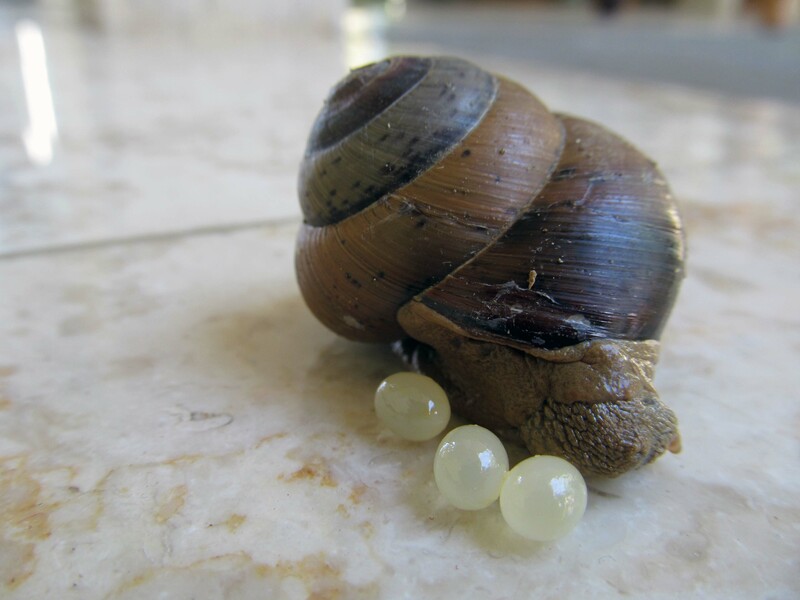 I stopped right in my tracks on the terrace outside my room when I saw the stagnant snail. Was it dead, I first wondered? 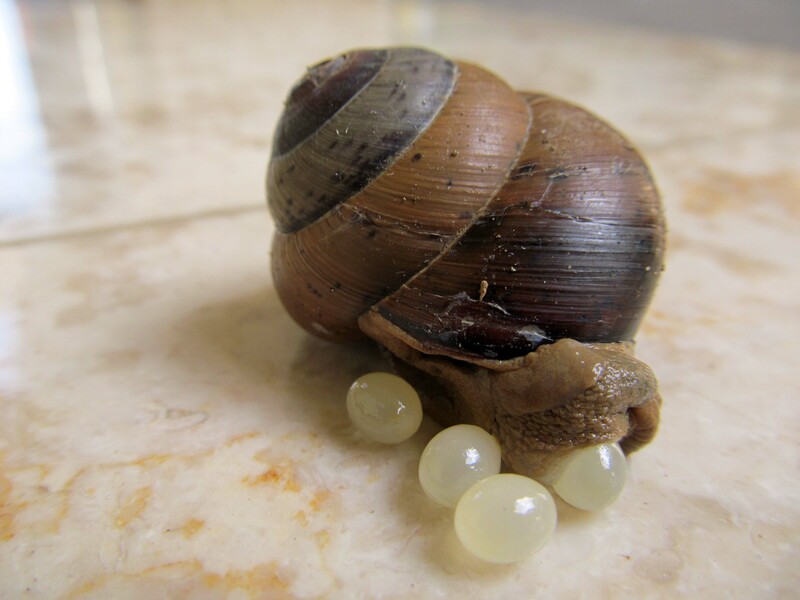 I knelt by its side, and tapped its shell ever so lightly (are you there?). No response. But, then, as if in non-verbal response to my knocking, it suddenly came to life, wiggled around a bit, and out from its end (front? backside?) spilled forth a pearly-white barley-sized pod. I crouched down closer. What is that, I asked out loud to no one in particular. Moments later, another one rolled out. Then, minutes later, another. And another. Six in total. What was this, a pretty pearly-poo party? This demanded a quick fix of Googling. AHA! 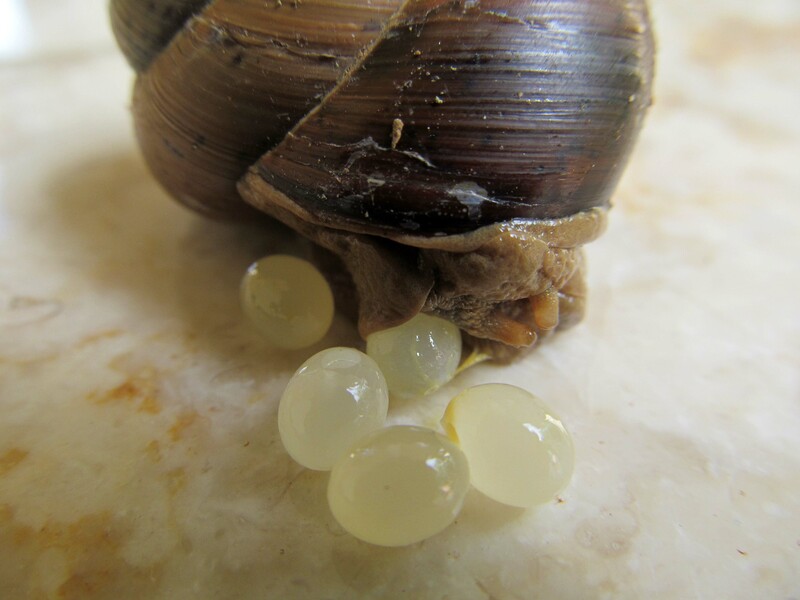 The snail was laying eggs. In full view, for me to watch, gaze, stare at, and WONDER… An exquisite life-giving display was unfolding right in front of my eyes. 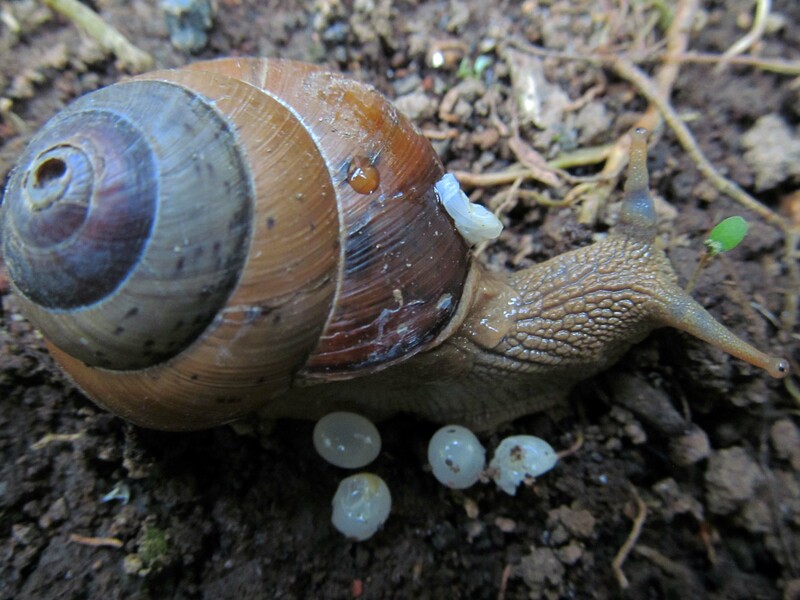 I invite you, especially all of you urbanites, to put “observe a snail laying eggs” on your Bucket List. I’m almost certain that you will be in as much awe as I was today. Have you Shared, Liked, Spread, Emailed, Talked about my campaign today? If so, muchas muchas gracias!! 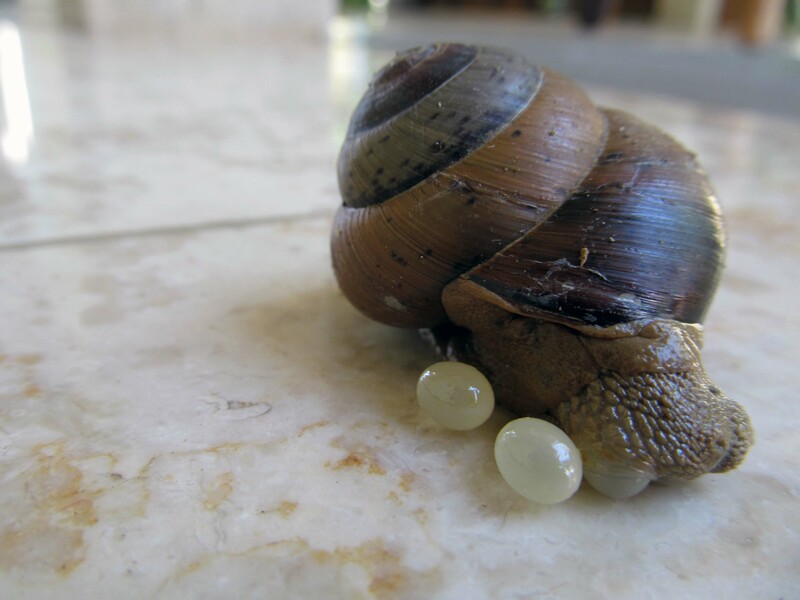 Ah ….. a message from one ‘caracole’ to another. You need six friends to walk with you. Each one can do ± 135 km and that way it won’t cost them a fortune! Follow two Chiropractors on their journey into a Life of service, with Open hearts, and a Vitalistic philosophy: EVOLv the mind, body, and soul. A journey through the toughest challenge of my life.